Since high-frequency measurements frequently require unavoidable lengths of transmission line, HF measuring techniques usually involve an application of transmission-line principles. 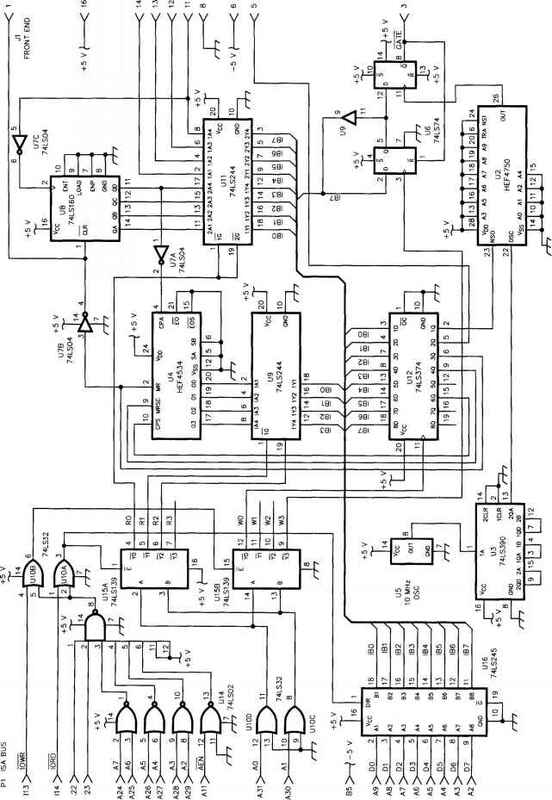 The bridge circuit to be described is no exception. Understanding its operation requires a clear picture of the concepts of reflection coefficient and return loss. 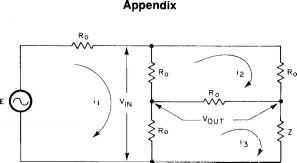 Consider an ac generator with an internal impedance R0 and a voltage E as illustrated in Fig 1A. When the output of this generator is connected to a load having an impedance equal to R0, the output voltage is E ~ 2. In the case where this load is the input impedance of a section of transmission line having a characteristic impedance R0, it is convenient to consider the input voltage as consisting of two components—a main voltage wave, em, (travels down the line away from the generator), and a reflected wave, er, (travels back from the far end towards the generator). When the transmission-line section is terminated in R0, the reflected wave is zero and the input voltage is simply em (Fig 1B). This terminology can be applied even when there is no transmission line in the circuit. It may correctly be said in reference to Fig 1A that the voltage across the load, R0, is em. In the case where the generator feeds a section of transmission line terminated in some impedance other than R0, the input voltage can be considered to be the sum of em and er (Fig 1C). Similarly, the voltage across any load connected to a generator can be considered to be the sum of a main wave and a reflected wave (Fig 1D). Fig 2—A graphic description of the reflection coefficient. A further convenience is achieved by expressing the reflection coefficient logarithmically. The return loss is defined as 20 log10 k. Thus, it is the ratio of er to em expressed in decibels. The interrelation between return loss, reflection coefficient and SWR is indicated on the nomograph of Fig 3. A convenient way of measuring an unknown impedance is to separate the reflected wave from the main wave and to measure its relative magnitude and phase angle. This is commonly done in HF and microwave testing by the use of a directional coupler. Another approach is the use of a bridge. Fig 3—The nomograph illustrates the interrelationship between the return loss, reflection coefficient and SWR. Fig 5—The terminated bridge is shown at A. At B, if all six resistors are equal in value, Zin = R0 when a resistor is removed from the circuit. Fortunately, an alternative configuration is available. The terminated bridge illustrated in Fig 5A has several characteristics that make it especially suitable for this application. When all six resistances are equal, the impedance seen when you look into the network at the remaining terminals (after disconnecting any one of the resistances) is always equal to R0. Thus, for example, in Fig 5B the impedance seen between A and D with no. 1 resistor removed is equal to R0. When the resistors are equal to the characteristic impedance of a particular coaxial cable, the bridge has matched input and output impedances. Fig 4—This graphic shows how a bridge can provide a voltage equal to the reflected wave. the same as em. If the voltage between the center points of the two dividers is measured, it is found to be the difference between em plus er and em, which is er. Thus, the output voltage V of this network is identical to the reflected voltage component from the impedance Z. Unfortunately, this simple circuit uses a voltage source having an internal impedance of zero and a voltage-measuring device with an infinite impedance that measures the difference of voltage between two points, neither of them grounded. As a practical matter, these conditions are difficult to approach. Fig 6—This illustration shows that the transmission loss from the input terminals of the bridge to Vout is equal to the return loss of Z (R0) plus 12 dB. The terminated bridge has a further advantage; it provides an output voltage precisely equal in magnitude and phase to a constant times the reflection coefficient of the unknown. This is illustrated in Fig 6, which states that the transmission loss from the input terminals of the bridge to Vout is equal to the return loss of Z (referred to as R0) plus 12 dB. This relation is fully derived in Appendix 1. It may be understood better by referring to Figs 7 and 8. Fig 7 shows that the input voltage to a matched load connected between C and D (em) is equal to the bridge input (Vjn) reduced by 6 dB. Fig 7—The input voltage to a matched load connected between C and D (em) is equal to the bridge input (Vin) reduced by 6 dB. Fig 8—Fig 7 is redrawn to show the voltage division experienced by the return wave from Z. In Fig 8, the bridge is redrawn to show the voltage division experienced by the return wave from Z. It comes back into terminals C and D and is attenuated 6 dB before coming out of terminals B and C.
Fig 9—To build a practical matched bridge, it is necessary to provide a transformer having balanced-input terminals. quency performance can be obtained. The problem of providing a differential voltage measurement between two ungrounded terminals is still present. To build a practical matched bridge, it is necessary to provide a transformer having balanced-input terminals (Fig 9). It is possible to build such a transformer with a very wide range of frequency response. The resulting bridge is conveniently connected to provide a calibrated sweep display as illustrated in Fig 10. A high-speed coaxial switch (Jerrold Model FD-30) is connected so that in the up position it connects the output of the sweep through a 12-dB pad and a standard variable attenuator to the input of a wideband amplifier. The amplifier is followed by a detector and scope and displays a curve representing loss v frequency. In the down position, the switches insert the bridge in place of the attenuators. Since the loss of the bridge is equal to the return loss of the unknown plus 12 dB, the scope shows a plot of return loss v frequency with a reference line corresponding to the setting of the standard variable attenuator. The performance of a particular bridge is illustrated in Figs 11 to 16. This bridge was designed for a characteristic impedance of 75 ohms and the test circuit covered a frequency range from 4 to 100 MHz. Fig 11 illustrates the relation between the reference line and the bridge response with the unknown terminal of the bridge open circuited. The bridge indicates 0-dB return loss within about 1/2 dB from 4 to 100 MHz. Fig 12 shows the same situation with the unknown terminal short circuited, again indicating 0-dB return loss with approximately 1/2 dB error. Fig 10—Bridge sweep frequency test set-up. Fig 11—Bridge response at 4 to 100 MHz; open circuit. Fig 12—Bridge response at 4 to 100 MHz; short circuit. Fig 13—Bridge response at 4 to 100 MHz; optimum termination, 50-dB reference. Fig 14—Bridge response at 4 to 100 MHz; 70-ohm termination, 30-dB reference. 50-dB return loss corresponds to an SWR of 1.06. It is apparent that this technique is capable of precision comparable with the best that can be obtained with other HF measuring techniques. Although this method is extremely precise, (ie, it can compare an unknown with a standard and show deviations of considerably less than 1%), its accuracy is entirely dependent on the accuracy of the standard impedance against which the bridge is tested. Where suitable standards are available, its accuracy can be nearly as good as its precision. Fig 14 shows the agreement between the reference line and the bridge loss when the bridge was first adjusted for balance with a 75-ohm resistor. A resistor was then substituted and its dc resistance was accurately adjusted to 70 ohms. A 70-ohm resistor in a 75-ohm system gives an SWR of 1.07 or a return ioss of 29.2 dB. The reference line on this trace was 30 dB. The delay-line method of sweep-frequency impedance measurement provides a convenient method of measuring HF impedances with a minimum of equipment. Practical characteristics of delay lines limit the usefulness of this method to relatively wide-frequency bands. The bridge technique has no such limitation. It is equally useful for extremely narrowband measurements or extremely wideband measurements. Fig 15—Bridge response; markers 100 MHz ±1.5 MHz, 10 dB-reference. return loss in the pass band of approximately 10 dB. Notice the simplicity of this presentation and the ease with which an operator could adjust such a filter to meet given frequency and return loss specifications. Fig 16—Bridge response at 4 to 100 MHz; input of a 1000-foot piece of highgrade coaxial cable, 40-dB reference. high degree of speed and accuracy. The sweep frequency technique provides a convenient way of observing the frequency variation of gain or loss. It is also possible to measure these quantities simultaneously with the sweep presentation. The wideband return-loss bridge provides the same degree of convenience in viewing and measuring the frequency variation of return loss and offers both speed and convenience in laboratory and production testing of HF networks.